The South Moluccas is represented in UNPO by the Republic of South Moluccas, the Republik Maluku Seletan (RMS). The south Moluccas homeland consists of some 150 islands located in the Banda Sea. 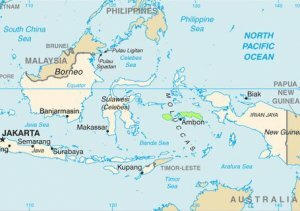 Its main islands are Ceram, Ambon and Buru. EA1600s The Netherlands invaded the South Moluccas and incorporated the region into the Dutch East Indies. 1949 The Dutch ceded sovereignty to an independent Federal Republic of Indonesia. The South Moluccas formed part of the state of Eastern Indonesia, one of the member-states of the Federation. 1950 Indonesian President Sukarno intended to change the states character from a federal into a unitarian state and the South Moluccans declared their country independent from the component State of east Indonesia. Since the declaration, the South Moluccas struggle politically world-wide for recognition of their rights to self-determination and independence as a free republic. 1951: Moluccan islands were occupied by Indonesian forces. 1966: The government of the South Moluccas functioned as a government in exile in the Netherlands. 1978: The Dutch parliament decided to regard the case of the South Moluccas being closed, no official contacts have taken place between the two governments. 1991: The South Moluccas became a member of UNPO. 1996: The repression of the Moluccans continues. Many Indonesians have migrated to the region taking the better job opportunities. The South Moluccas continue in their struggle for international recognition and eventual independence. Because of Indonesians transmigration policy, the South Moluccans may become a minority in their own country. With the growth and the increasing boldness of the democratic movement in Indonesia, the resistance in the Republic of South Moluccas has the opportunity to enter a new direction and gain momentum. Increased contacts with the government in exile make the development of a unified national and international strategy an important task for the RMS government and people on the ground.